The Western (Royal) Portal at Chartres Cathedral (ca. 1145)-these architectural statues are the earliest Gothic sculptures and were a revolution in style and the model for a generation of sculptors. Gothic art was a style of medieval art that developed in Northern France out of Romanesque art in the 12th century AD, led by the concurrent development of Gothic architecture. It spread to all of Western Europe, and much of Southern and Central Europe, never quite effacing more classical styles in Italy. In the late 14th century, the sophisticated court style of International Gothic developed, which continued to evolve until the late 15th century. In many areas, especially Germany, Late Gothic art continued well into the 16th century, before being subsumed into Renaissance art. Primary media in the Gothic period included sculpture, panel painting, stained glass, fresco and illuminated manuscripts. The easily recognizable shifts in architecture from Romanesque to Gothic, and Gothic to Renaissance styles, are typically used to define the periods in art in all media, although in many ways figurative art developed at a different pace. 14th Century International Gothic Mary Magdalene in St. John Cathedral in Toruń. Although there was far more secular Gothic art than is often thought today, as generally the survival rate of religious art has been better than for secular equivalents, a large proportion of the art produced in the period was religious, whether commissioned by the church or by the laity. Gothic art was often typological in nature, reflecting a belief that the events of the Old Testament pre-figured those of the New, and that this was indeed their main significance. Old and New Testament scenes were shown side by side in works like the Speculum Humanae Salvationis, and the decoration of churches. The Gothic period coincided with a great resurgence in Marian devotion, in which the visual arts played a major part. Images of the Virgin Mary developed from the Byzantine hieratic types, through the Coronation of the Virgin, to more human and intimate types, and cycles of the Life of the Virgin were very popular. Artists like Giotto, Fra Angelico and Pietro Lorenzetti in Italy, and Early Netherlandish painting, brought realism and a more natural humanity to art. Western artists, and their patrons, became much more confident in innovative iconography, and much more originality is seen, although copied formulae were still used by most artists. Painting in a style that can be called Gothic did not appear until about 1200, nearly 50 years after the origins of Gothic architecture and sculpture. The transition from Romanesque to Gothic is very imprecise and not at all a clear break, and Gothic ornamental detailing is often introduced before much change is seen in the style of figures or compositions themselves. Then figures become more animated in pose and facial expression, tend to be smaller in relation to the background of scenes, and are arranged more freely in the pictorial space, where there is room. This transition occurs first in England and France around 1200, in Germany around 1220 and Italy around 1300. Painting during the Gothic period was practiced in four primary media: frescos, panel paintings, manuscript illumination and stained glass. Hours of Jeanne d'Evreux, by Jean Pucelle, Paris, 1320s. During the late 13th century, scribes began to create prayer books for the laity, often known as books of hours due to their use at prescribed times of the day. The earliest known example seems to have written for an unknown laywoman living in a small village near Oxford in about 1240. Nobility frequently purchased such texts, paying handsomely for decorative illustrations; among the most well-known creators of these is Jean Pucelle, whose Hours of Jeanne d'Evreux was commissioned by King Charles IV as a gift for his queen, Jeanne d'Évreux. Elements of the French Gothic present in such works include the use of decorative page framing reminiscent of the architecture of the time with elongated and detailed figures. The use of spatial indicators such as building elements and natural features such as trees and clouds also denote the French Gothic style of illumination. 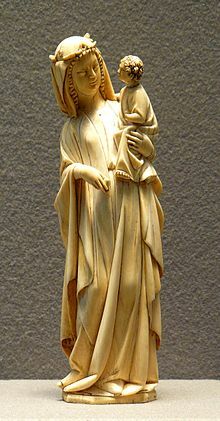 French ivory Virgin and Child, end of the 13th century, 25 cm high, curving to fit the shape of the ivory tusk. 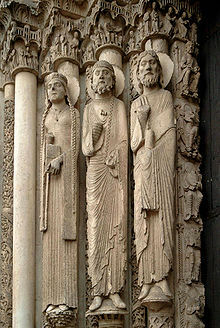 South portal of Chartres Cathedral (c. 1215–20). West portal at Rheims Cathedral, Annunciation group. Nicola Pisano, Nativity and Adoration of the Magi from the pulpit of the Pisa Baptistery. Claus Sluter, David and a prophet from the Well of Moses. Base of the Holy Thorn Reliquary, French (Paris), 1390s, a Resurrection of the Dead in gold, enamel and gems. Man of Sorrows on the main portal of Ulm Münster by Hans Multscher, 1429. Panelled altarpiece section with Resurrection of Christ, English Nottingham alabaster, 1450–90, with remains of colour. Detail of the Last Supper from Tilman Riemenschneider's Altar of the Holy Blood, 1501–05, carved limewood, Rothenburg ob der Tauber, Bavaria. Lid of the Walters Casket, with the Siege of the Castle of Love at left, and jousting. Paris, 1330–1350. Image of Cristo de La Laguna (Tenerife, Spain) from Flanders and dated between 1510–1514. 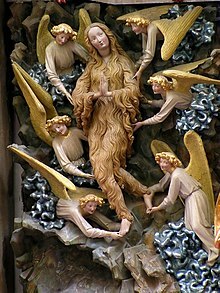 Gothic sculptures independent of architectural ornament were primarily created as devotional objects for the home or intended as donations for local churches, although small reliefs in ivory, bone and wood cover both religious and secular subjects, and were for church and domestic use. Such sculptures were the work of urban artisans, and the most typical subject for three dimensional small statues is the Virgin Mary alone or with child. Paris was the main centre of ivory workshops, and exported to most of northern Europe, though Italy also had a considerable production. An exemplar of these independent sculptures is among the collections of the Abbey Church of St Denis; the silver-gilt Virgin and Child dates to 1339 and features Mary enveloped in a flowing cloak holding an infantile Christ figure. Both the simplicity of the cloak and the youth of the child presage other sculptures found in northern Europe dating to the 14th century and early 15th century. Such sculpture shows an evolution from an earlier stiff and elongated style, still partly Romanesque, into a spatial and naturalistic feel in the late 12th and early 13th century. Other French Gothic sculptural subjects included figures and scenes from popular literature of the time. Imagery from the poetry of the troubadours was particularly popular among artisans of mirror-cases and small boxes presumably for use by women. The Casket with Scenes of Romances (Walters 71264) of 1330–50 is an unusually large example with space for a number of scenes from different literary sources. Wikimedia Commons has media related to Gothic art. Wikimedia Commons has media related to Gothic painters. ^ "Gothic art". Encyclopedia Britannica. Retrieved 2017-06-22. ^ Kirsten Trampedach: Introduction to Danish Wall Paintings – Conservation Ethics and Methods of Treatment. National Museum of Denmark Archived 24 November 2009 at the Wayback Machine. Retrieved 6 September 2009. "Gothic: Art for England 1400–1547". Victoria and Albert Museum. Retrieved 2007-06-08.